Naughts & Cross stitches: I give UP! As much as I love the idea of starting a new project every day of January and I have all the materials ready to go, it is too much. My head doesn't like having that many projects currently on the go. I can't keep track of them in my head. I find myself wanting to FINISH something. So I am changing the rules. I will eventually start all the projects on my list BUT I won't start another one until I have finished at least one project on my list. This should save my sanity. Though while protesting starting I have managed to make some decent progress on Winter Fairy. I'm starting to reach the bottom of the white on the left and can play with some other colours there. I love working on this piece. The whites are very close in colour and then I step back and see the clever shading. So beautiful. I love working on this piece, and I think if I continue as I am it may be finished in the not too distant future. Though I do have back stitching and beading coming up and I've never tried that on cross stitch before. Your stitching is beautiful. I'm looking forward to seeing a finish, so you can start a NEW one! Happy Stitching! I had the same problem last year - it is meant to be fun, so changing the rules to suit you is probably the best. Winter Fairy is looking great - is she a Mirabilia fairy? Love the fabbie, too, what is it? 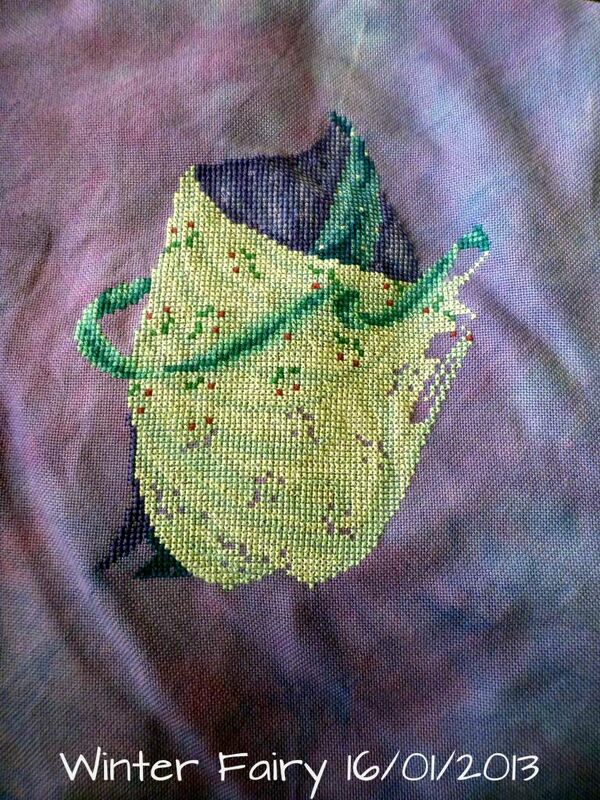 Great progress on Winter Fairy. Sorry to hear your giving up on the Ultimate Crazy Challenge. Will look forward to seeing your other starts through out the year. Stitching is meant to be relaxing so if it stresses you do what you need to make you feel good again. Winter fairy looks amazing !!!!! I agree with you....I'd be in a total tizz if I had that many projects started! Do whatever makes you happy, after all your hobby is supposed to be fun! Love the progress on the winter fairy, she's going to be a stunning finish. That's the reason I don't participate on the crazy january, it's just too much. I have a lot off things to make and finish and starting more would make me crazy. Is it the Joan Elliot fairy? I have finished the summer fairy and earth goddess from her.